The canter depart or strike off can be a real sticking point for some riders. 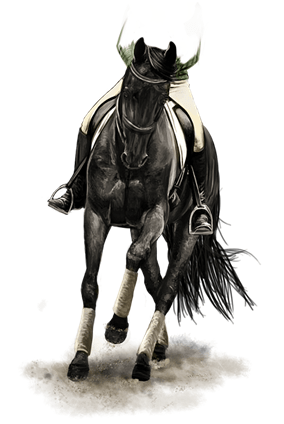 In the third of our Real Life Rider Series, the rider is struggling with correct canter lead. In my experience this is a very, very common problem, although those who have it seem to think that everyone else can canter perfectly well and they are the only ones struggling! Thanks for the question. I hope my response will aid a good many fellow equestrians. The first thing to note is that it is almost certainly the rider that is creating the issues and recognising this is a huge step to correcting the problem. So, here we are with a problem to solve, the solution may not be pretty; it may not be how you would want to ride in a test situation; it will – without doubt – be something that you will do for the fix and then forget. Here goes … firstly let’s look at the trot prior to the canter depart. You should go for a strong contact. Have the horse up in your hands, have the trot really forward but feel the contact a little more than usual, keep half-halting in the trot until you feel that the horse is putting in some effort and maybe even a little strong, create the circle of energy that you need to have full control of your horse. When you are happy that you have a forward trot that feels a little more ‘UP’ than usual you are ready to ask for the depart. When you ask for Canter, you can do it anywhere. Be very, very subtle about it. Inside leg on, outside leg sweeps back gently. Because you may be leaning and tensing, don’t think asking on the corner or circle is better, indeed it is not if you are leaning. Under no circumstances drop the contact. You are trying to help your horse balance himself with you on board during the transition. It is not fair to him to abandon the contact and say – ok do it all yourself! You need to help the horse by lifting the hand slightly (an inch maybe), sitting well back in your seat – leaning back is better than forward, look to the skies, hold the contact – half halt (I’m going to ask you something different) and ask for the canter. Then wait. Don’t start pushing with your seat, leaning forward, shoving the hands forward, and willing him with every fibre of your body to go, just sit up and wait. If it does not happen, back to trot and try again, rebalance the trot (do not allow the horse to run) if you need to back up your leg with a tap from the whip, so be it. I cannot emphasise enough the “Think Up into Canter” UP, UP, UP – say it as you do it. It’s difficult to lean forward, look down etc., if you are saying “UP into Canter” to yourself. 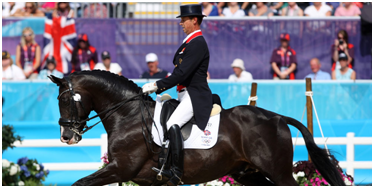 Shoulders back, give the horse space to bring his hind legs under him, lift his forehand and make a strike off. Lots of praise in the form of voice when he gets it and enjoy the feeling you get, soak it up, you will have many more of them, but this is the first – it’s special, you need to remember it so that you can make it a habit. Do not pat to reward – you can’t afford to give away the contact! My young horse will strike off on incorrect left lead if I’m sloppy! It’s her way of telling me to put in more effort. So, you have this great canter transition sorted, but the horse won’t stay in canter. He won’t stay “in front of the leg”. Again look to yourself to see what it is about your position that is causing this problem. You are probably leaning forward and you may have tension in your legs. When the horse backs off or comes back to trot without you asking you will need to make the transition to canter again, and whilst the brain is saying if you lean forward and shove your hands forward and push with your seat the horse will respond with forward (it would if you were a cowboy and wanted to gallop, heck why not go all the way stand up in your stirrups and shout Yee-Hah! – please resist this!). Sit still, no pushing, sit softly and relax the legs. Sit up with your pelvis forward. It might feel odd but have a look at how Cart Hester sits. He encourages his belly button forward – this will engage your back muscles so you will know the next day if you have done it correctly! You may need work with no stirrups, or work on the lunge so that any balance issues can be resolved. It is so easy for me to say relax – but that is what you must do. If you can’t relax your legs and have them entirely independent of your upper body, you should get help to learn how. Maybe someone could lunge you, in canter, preferably without stirrups – but one step at a time eh? If you could get someone just to have you on a lunge line but not actually lunge the horse and you ‘do the work’ i.e. ask for canter when you know you have no option but to remain on a circle it might do the trick. One more exercise – Turn on the forehand. Establish this exercise with your horse to engage the hind quarters. Then you can do this before you ask for the canter and he will definitely be more engaged and freer behind. Finally – walk to canter. The best way to find out if you’re aids are correct for canter is to do walk to canter. Don’t forget, think UP and from a forward walk, ask for canter. Exactly as above, say the words “Canter” that your horse associates with lunging. With the horse that will not maintain the canter, say the words “canter, canter, canter” as go along, this is partly the purpose of lunging the young horse, to associate the words with the actions so that you can use them when training. Great tips, can’t wait to try this out today. My horse always has problems on one particular leg, but maybe it’s me! Let me know how you get on Emma, come back and comment. Thanks I always struggle with this, I tend to look down, now will be thinking up, up up! And you will become Superwoman in your thinking Valerie. Good luck! Hi, in addition to my earlier canter issues, I thought I may add, walk to canter is so much easier than trot to canter, so I was/am sometimes still, tensing up and spoiling things in the sitting trot, don’t worry I am working through it again…. early in training with a 17 hand very foreward swedish warmblood i droped canter work to get the trot work under control and responding to the aids first .when i cme back to canter months later he would give me a depart then after a few strides start to get tense, bunched up with some attitude. i corrected all other possibilties first and there was an issue with the right front foot and the saddle fit… new saddle and no shoes later …yes i came back from a 2 month trip…but I put all my duckies in a row on restart…I was just troting and he offered a smoothe soft canter ! wow I took it ! when i asked for it in the other direction after a few strides he ripped the riens through my hands to the ground and it was full on rodeo even after he bucked me off ….ok so now what ? there was no warning that was in him! so is it attitude, residual discomfort memory, my riding skill? ?nothing about that laid back day and what we did makes any sense for what happened..my trust has been compromised…i had a master ride him . he got the canter going and it took some time to get to some relaxation in him. before he could tranfer this over to me a family issue arose over which I brought my horse home for 18 months turn out. i am now back in a new barn facing restart on my own and would like your take on my situation and how to get the canter with out bucking. I have access to two round pens one with high wood sides. Many years since I’ve been on a horse, but your blog brings back many happy memories. Thanks for that Samantha. Makes me happy too. I had a very similar problem to Virginia with a horse that would rodeo buck at the canter once out of every 25 departs or so… it wasn’t consistent enough to make sense to me and every time I thought it was gone, the tension/bunched up feeling would happen out of nowhere and he would try to leave me in the footing! I’m not sure how to address it because of its inconsistency and the fact that he absolutely does not do this with our trainer in the same tack and our vet has not found any issues otherwise. Any advice would be wonderful. 🙂 Your blog is great food for thought! A lot of these tips have gone a long way for me! Thank you, Patricia! In that time I have had a second opinion on his x-rays and it seems that he might have had a cannon bone fracture a few years ago that could be causing the problem. Not sure why his original vet missed this?! At least I am only leasing him but it seems like it might be the culprit… I am not in the UK but hadn’t thought about biometrics so I will remember that in future, thank you! Thanks for your lovely comments, glad it’s all helping. When I say ‘ask for canter’ it is the whole process really. All of this, in one moment is the ASK.